The other gate is located on the western side, which was called after king IV. Adalbert from the House of Arpad. Its purpose and significance in history can be compared to the Saint Stephanus'. 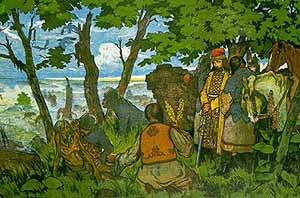 He is rightly considered the second forefather because after the Tatar's invasion the country had to be rebuilt again from its ruins. The Tartars could never occupy the Komárno castle. The king awarded the three settlements (Komorn, Saint Andreas, Kezu), which made actually the town Komorn, with the same rights that Buda citizens had in 1265.